Stand out from the crowd with an astonishing LightWall backlit display that will enchant, engage and energize your audience. Our backlit displays combine seamless edge-to-edge imagery with true white LED lights for maximum graphic impact. The fabric graphic panels are lightweight, compact, durable, machine washable and custom-tailored to produce a wrinkle-free fit and finish. Bright white LED lights save energy and last up to 10,000 hours. Assembly is easy because the lights travel pre-installed within the extrusion channel. Tool free assembly means frame sections glide together and tighten with thumb screws. Light modules connect between frame sections, base plates mount to either side, the graphic panel edge presses into the channel on the front of the frame and the liner is attached by Velcro™ to the backside. Double sided displays are easily created by connecting two frames back-to-back. Amazingly, this LightWall backlit display pack into just one RollOne Case with a counter conversion that ships UPS and FedEx! 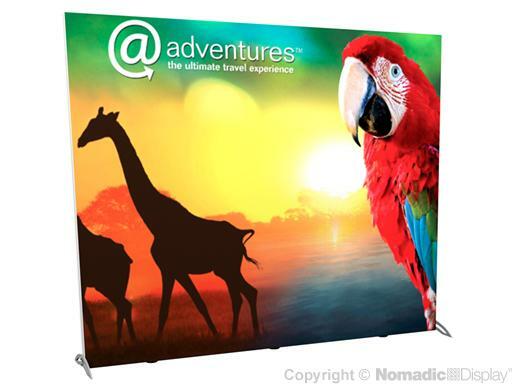 Made in the USA, all Nomadic displays are backed by the industry’s best lifetime warranty.